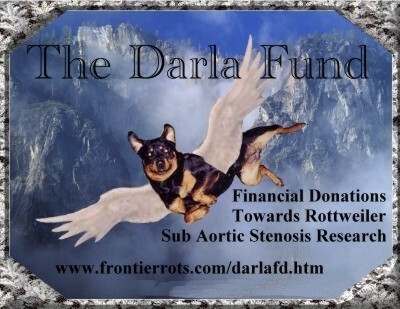 Want to donate to the Rottweiler Health Foundation towards SAS research? "Thanks so much for your interest in supporting our research into cardiac genetics. If you would like to make a donation to the laboratory, you can do so through the center that houses our laboratory - the Center for Companion Animal Health. There is a form or a link at the following website https://give.ucdavis.edu/VETM/V435LAB that directs you to giving instructions. If you choose to make a donation - please be sure that your donation says: Center for Companion Animal Health - STERN LAB on the donation. After completing a donation please notify us at sterngenetics@ucdavis.edu and we will then follow the donation and ensure that it makes it to the appropriate project / fund. If you wish to make more than an individual donation or organize a donation event, please contact Dr. Stern or our development office in order to ensure that funds are appropriately directed." (VP rated Frontier Justagenius Darla). 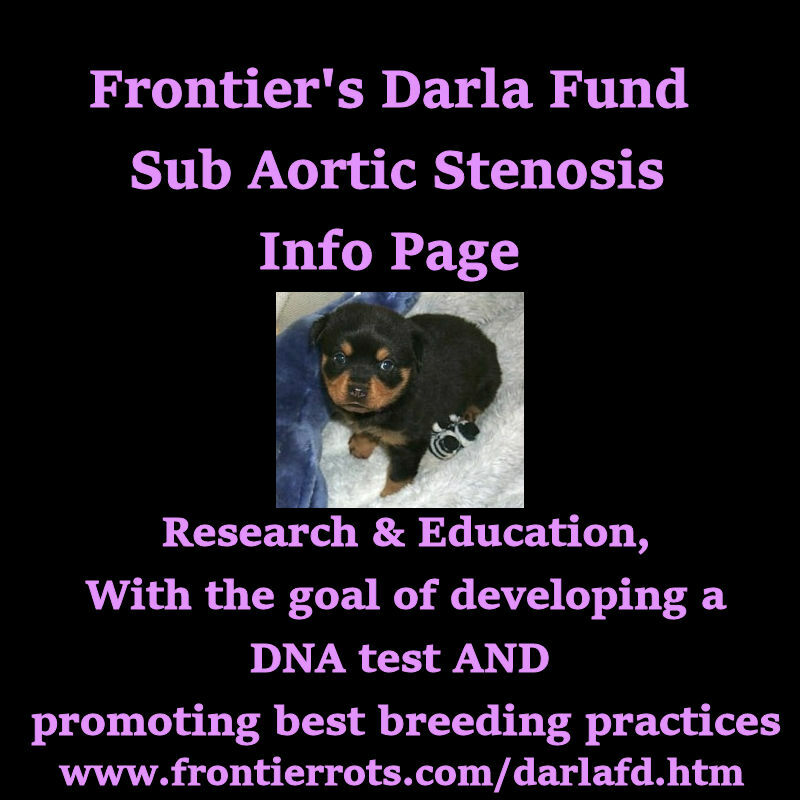 Darla died as a direct result of the Sub Aortic Stenosis she was born with. To skip the SAS overview, click one of the below links. Sub Aortic Stenosis (SAS) is the most common congenital heart defect in Rottweilers. Rottweilers are affected with SAS on all continents and almost all bloodlines. Many of the presumed heat stroke or poisoning deaths are later found (if a necropsy is done) to have been SAS deaths. SAS involves the narrowing of the out-flow tract from the left ventricle leading to the aorta. When there is a narrowing of the tract, the heart must pump harder to get blood through the smaller opening. As the SAS-affected dog matures, his/her heart develops a thicker muscle to push harder, which (in moderate to severly affected dogs) leads to an irregular heart beat, a lack of blood to the heart, congestive heart failure, or sudden death. SAS is diagnosed in living dogs by a cardiologist performing a dopplar echocardiograph exam of dogs. Severe cases can often be tentatively diagnosed by auscultation. Practitioner exams even if by echo are NOT definitive! Research is indicating that the mode of heritability can vary by breed, and originate at different gene locations. For example Newfoundand SAS is a totally different gene location than Golden Retrievers and Rottweilers, and Newfoundlands NOW have a DNA test! Rottweiler friends this is going to be long but please read. 3- velocities If lvot reading is taken subcostal (under ribs probe pointing forward ) then anything under 2.0 m/s is acceptable If lvot reading is not taken subcostal (below ribs) then lower levels. Also read the Rottweiler Health Foundation post 3/2/19 An update on SAS research grant. RESEARCH PROGRESS REPORT SUMMARY Grant 02520-MOU: Identification of Genetic Markers for Familial Subvalvular Aortic Stenosis in Rottweilers Principal Investigator: Research Institution: Grant Amount: Start Date: 2/1/2018 Progress Report: Report Due: 1/31/2019 Joshua Stern, DVM, PhD University of California, Davis $44,320.00 End Date: 1/31/2020 End-Year 1 Report Received: 2/15/2019 (The content of this report is not confidential and may be used in communications with your organization.) Original Project Description: Subvalvular Aortic Stenosis (SAS) is a heart defect characterized by a fibrous ridge located below the aortic valve. Affected dogs are at risk of developing heart valve infections, congestive heart failure or sudden death. Severely affected dogs have an average lifespan of 19 months. SAS is an inherited heart problem reported in Rottweilers. The goal of this research is to identify causative genetic mutations and develop a reliable genetic test for this condition in Rottweilers, to aid breeders in making informed decisions to reduce the prevalence of this condition. Once a chromosomal region of interest is identified via a genome wide association study (GWAS), whole genome sequencing (WGS) will be employed to identify variants associated with SAS. The top variants identified via WGS will be submitted for Sequenom analysis to prioritize variant pursuit. Funding for the research is provided through the collaborative efforts and generosity of the Rottweiler Health Foundation. The AKC Canine Health Foundation supports the funding of this effort and will oversee grant administration and scientific progress reports. Publications: Ontiveros, E. S., Fousse, S. L., Crofton, A. E., Hodge, T. E., Gunther-Harrington, C. T., Visser, L. C., & Stern, J. A. (2019). Congenital Cardiac Outflow Tract Abnormalities in Dogs: Prevalence and Pattern of Inheritance From 2008 to 2017. Frontiers in Veterinary Science, 6. (Same link as I posted above) Presentations: Poster: Identification of genetic markers for familial subvalvular aortic stenosis in Rottweilers. Conference: The 2018 National Veterinary Scholars Symposium Report to Grant Sponsor from Investigator: Subvalvular aortic stenosis (SAS) is one of the most common inherited heart problems reported in Rottweilers. For this study we aim to report the top variant(s) associated with SAS in this breed. We recently published a manuscript and determined that the prevalence of SAS in Rottweilers is 1.17%. (Diane Richardson comment-this is among submitted samples, I believe the actual incidence in real world is far higher) We also have completed the first aim of this study, and pedigree analysis results for the Rottweiler breed has been publish in Frontiers Veterinary Journal. A genome-wide association study analysis was also completed, and the region of association has been identified. We are currently waiting to receive whole-genome sequencing results to proceed with bioinformatic analysis. We are continuing to recruit affected and control Rottweiler samples for Sequenom variant segregation analysis. These are the single hardest "grades" or "diagnosis" to accept. 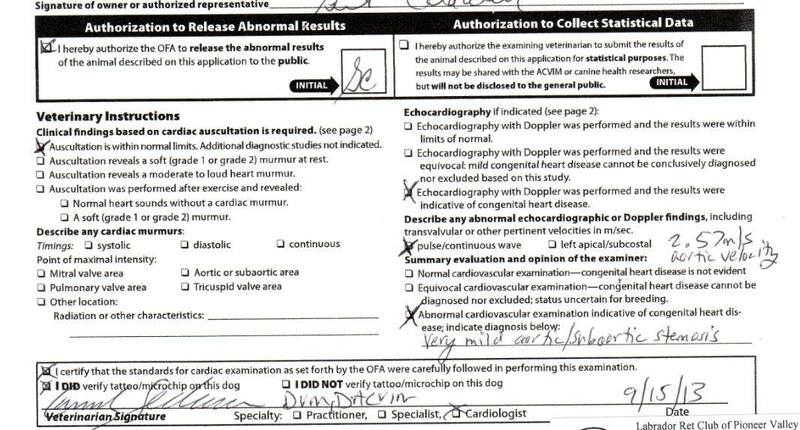 To have your dog graded as Equivocal or worse, affected with mild SAS and yet the cardiologist tells you the heart looked and sounded perfect on echo, with perhaps very slight aortic insufficency, aortic regurge, turbulance etc. and that your dog would have PASSED a simple auscultation exam. So you get a grade you never expected. HOW can this be you want to know?! The facts are simply that the equipment we currently have is not sensitive enough to image all the tiny defects, BUT research and necropsies HAVE proven that these elevated velocities- especially when accompanied by aortic insufficiency, aortic regurge, turbulance etc- really are extremely slight affected dogs. IF you were to open your dog's heart up, you would be able to see the miniscule defects (and in a test breeding Newfoundland study they did just that, sacrificed some of the animals produced and examined the hearts). THIS is why I am such a STRONG advocate of breeding Rottweilers (and preferably all Rottweilers having heart certifications done) being echoed BECAUSE auscultations can and do MISS mild and equivocal affected dogs!!! "a device that images from outside the heart could never be as accurate as looking directly at the inside of the heart. As such, The presence of a subvalvular ridge on echo is not a requirement for diagnosis of mild or equivocal SAS. Simply the velocity has been used by cardiologists for years." Dr K. Meurs & Dr J. Stern have conducted U.S. studies for the Golden Retrievers, Newfoundlands and Boxer breeds. Dr Meurs conducted a very limited retrospective pedigree study for Rottweilers through the RHF (Rottweiler Health Foundation) but this study was hampered by a serious LACK of participants. Since I receive calls and emails monthly from owners of afflicted dogs I KNOW this was not caused by a lack of incidence of SAS in our breed. Instead the lack of participation is directly linked to the number of breeders/owners who decline to participate! Preliminary findings are that the gene(s) is/are probably similar as that which afflicts Golden Retrievers (but not the SAME one) and the likely on just a single chromosome. A DNA test for this is highly likely, IF steady funding of the research happens. The Newfoundland breed got their test because of steady, generous funding AND participation. One Newfoundland study had 6,000 dogs participating! Rottweiler people are FAR less likely to donate samples or money. They are currently STILL looking for DNA samples from Rottweilers with a diagnosis of Subvalvular aortic stenosis (diagnosed by Doppler echocardiogram) or proven clear of Subvalvular aortic stenosis (as cleared by a cardiologist echo ) to advance their study to identify a gene for the disease. VERY encouraging news, more research is needed and they need FUNDS!!!! 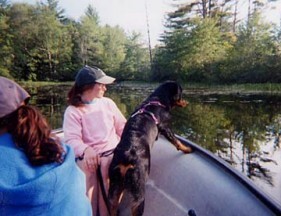 MANY THANKS to all for helping Darla's death (and that of other affected dogs) to help other Rottweilers in the future. Here is the special diet and supplements (developed through conversations with many herbal, holistic and natural nutrition educated people) we fed my Darla. She lived more than twice the length of time the vets gave her when she was diagnosed at 7 1/2 weeks old with grade III SAS by a board certified Cardiologist using dopplar echocardiogram. Darla was supposed to be dead by 6 months of age, she lived to be 14 months old. We are not veterinarians and we strongly encourage you to work with a veterinarian who is open minded to natural and holistic methods. We do not make any representation that following Darla's Diet will cure your dog- there is NO cure. What I do not want to say, but I must, Is that SAS WILL eventually kill your dog. Your dog may live weeks, months or even years post diagnosis- but the sad reality is that SAS WILL end your dog's life one day. We DO NOT promise that following Darla's Diet WILL definitely extend your SAS dog's life. NO ONE, not even veterinarians, can make that guarantee. You MAY slow the progression of SAS in your dog. This diet and supplement schedule DID (in our opinion) extend Darla's life , and certainly improved it's quality. Darla had a VERY fun and interesting life! I also fed her about a mostly raw diet and I think that made almost as big a difference as the supplements did. If we ran out of meat OR supplements you could really see a difference in her energy level and behavior. We make our own raw diet and I will tell you how below, BUT you can buy a premade raw diet like Oma's Pride, Halshan's, Purely Primitive, Victory, Primal, or Bravo, etc. For one dog the prepackage, premade raw diets are the easiest. They are a bit pricey but it takes quite a bit of work to make your own. You'll have to decide for yourself which will work best for you. To hand make your own version of Darla's Diet, you will need either a good juicer or a good food processor. These are to grind the veggies. If you use a juicer you mix the juice and pulp back together after grinding. Below is the Darla's Diet recipe. I make this in a large container and mix it really well. Then I scoop it out into semi packed 1 cup portions and make patties out of it and freeze 4 patties together in ziplock quart size freezer bags. As you will see it makes quite a bit. Usually dogs eat approximately 1/2 to 1 cup of THIS raw ground diet for every 1/2 cup of dry they were eating. BUT you have to watch your individual dog's weight because, some don't need anywhere near this much!! Raw is much, much more digestible than kibble, so some dogs utilize it MUCH better. Add the other supplements listed in the beginning of this page as you prepare each meal. If you choose to feed a prepared raw diet (like Halshan's, Aunt Jeni's, Oma's Pride, Bravo, Purely Primitive, etc), instead of making your own, check the labels. If the mix contains ground bone then do not add Calcium Citrate to it. If you have any questions at all or just need some hand holding let me know!! Doppler echo by a board certified cardiologist is the GOLD STANDARD and best screening tool we CURRENTLY have UNTIL a DNA test is developed. It has been proven that dogs CAN pass a cardiologist auscultation examination with a "perfect" sounding heart and yet fail an echo exam and be diagnosed with SAS. Remember even echo "clear" dogs still have a chance of producing an SAS positive puppy because UNTIL we have a DNA test nothing is a 100% guarantee of "clear". You greatly increase the odds of producing healthy, SAS free puppies though by only using breeding dogs who have been "cleared" via a cardiologist performed echo. Just as only utilizing hip "clear" dogs increases your odds of producing puppies with normal hips. Performing pedigree analysis of the cardiac statistics of all relatives-siblings, cousins, aunts, uncles, grandparents etc- assists breeders immensely as well. A cardiologist performed Doppler echo will allow you to evaluate velocities (LVOT) and breeding risks to the best of our current abilities. Rottweilers "should" only be used for breeding if LVOT is 1.7 m/s and below for the "best confidence level" possible. Breeding dogs with LVOT 1.71-1.89 m/s will give you an "element of risk". Dogs in 1.9 m/s and above range whether the cardiologist deemed them "passing" OR Equivocal BUT with NO cardiac structural defects, LVOT accelerations, turbulance/regurge, valve leaks or murmurs; brings the "greatest breeding risk" (only surpassed by dogs not echoed!) and should only be done under certain VERY strict conditions, with dogs possessing exceptional qualities and ONLY ever to dogs with LVOT below 1.7 m/s! NOTE: there are currently two sets of velocity (LVOT) guidelines. (until a DNA test is developed). The other is the newer ACVIM/ARCH version which is somewhat less strict and which I and the cardiologists I have used over the years, believe may allow too many higher velocity dogs (that may be silent affecteds) to be bred. The ACVIM/ARCH guidelines are at the bottom of this text. MY personal recommendation at this time, is to only breed echoed dogs with LVOT below 1.7 m/s.Preferably with siblings and relatives who have also been echoed and their LVOT and reports available. For those for whom this is too strict of a criteria; I offer a second set of breeding recommendations below, based upon differing categories and sub categories. For dogs without KNOWN SAS in their background and whose parents (and better yet siblings too) are cardiologist cleared; then a cardiologist (or 2nd best- a specialist) auscultation is generally considered "acceptable" at this time by many, BUT will still allow MANY dogs with elevated velocities yet no murmurs to be blindly bred, incorrectly assuming they are totally "clear"! HOWEVER, a cardiologist performed echo will allow you to evaluate velocities (LVOT), structure, blood flow patterns and breeding risks to the best of our current abilities. Those dogs that fall into this category should have a Doppler echo done by a cardiologist (or second best- specialist) and should ONLY be added to a breeding program if their velocity (LVOT) is 1.7 m/s or below for the lowest risk of SAS. See the top of the breeding recommendations for more details about breeding utilizing LVOT numbers. At NO POINT is a Practitioner certification EVER acceptable. MY current practice is to bring BOTH the OFA and ARCH cardiac forms with me to the cardiac exam and submit to BOTH organizations. The OFA form will allow your evaulation to be seen in a searchable database along with all your dog's other health tests and the ARCH form will provide you with more detailed information and will also add statistical data to a semi searchable database of ONLY cardiologist performed cardiac evaluations (you get a certificate from both groups). I base all of my above recommendations on conversations with Researchers from 2000 - 2006, extensive reading of the current and past research, and conversations with the cardiologists I have personally used over the past years since 1995.